‘Driving’ ahead for Sepsis as campaign reaches £10,000 mark. A local north east business has clubbed together to help raise over £6,000 for the Sepsis UK Trust. 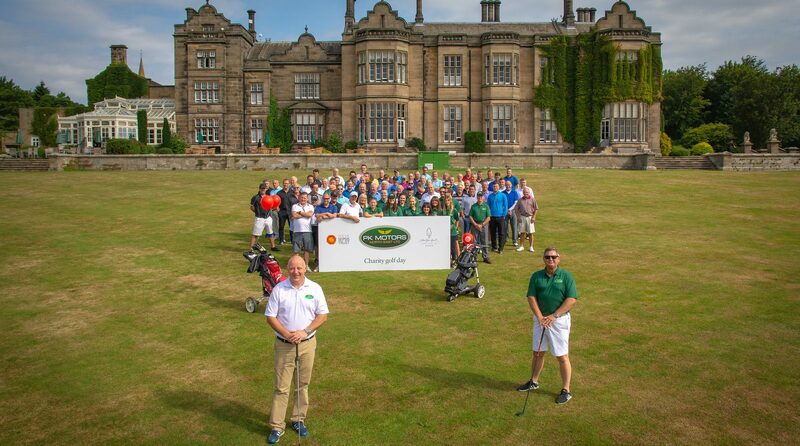 Organising a charity golf day held at Northumberlands prestigious Matfen Hall golf course, the event was attended by local businesses and customers of PK Motors. The fund raising was bolstered by a raffle and auction and a personal Just Giving page and the money raised will go directly towards a £50,000 fund raising campaign, set up by Newcastle based business Drummond Central, in memory of their work colleague Jess McEnroe who sadly lost her life to Sepsis aged just 26 years old in 2017. Paul Keighley, owner of PK Motors, said, “We are all delighted to support this amazing fund raising campaign set up in memory of Jess. “Sepsis is a terrible illness and can strike at anytime. It’s truly inspirational that we had so many businesses and customers taking part in the golf day and contributing their hard earned money to this worthwhile cause. Beth Hazon, Managing Director, Drummond Central, said, “This is an amazing gesture by everyone connected to the fund raising golf day. “Sepsis is a charity close to our hearts and this significant contribution from PK Motors will go a long way towards us reaching our £50,000 target. “We have an active programme of on-going events including staff taking part in the Great North run in September and we won’t stop until we have at least met the £50,000 target.” she added. The winning teams on the day included Auto Protect Warranties, Dipstick Research, Wilsons Auctions . Other businesses entering teams were JMF Print, Motor Novo Finance, Volkswagen Lookers, Status Security, Netcall, Tiger Communications, Davison Solutions, The Frontier Group, Tyne Valley Motor Homes, Manheim Auctions, Beecham Peacock, Jobling and Turnbull Ltd, Next Gear Capital, Swalwell Cricket Club, Neeco Ltd, Sunderland Coach Works and Take The Biscuit. PK Motors is based at Swalwell, Sands Industrial Estate, NE16 3DJ. For further information on how you can contribute to Drummond Central’s £50,000 fund raising campaign please visit https://www.justgiving.com/fundraising/for-our-jess. For further information about Sepsis or how to fund raise or volunteer please visit https://sepsistrust.org/about/. A fund raising charity golf day has raised over £5,000 for local charity the Lily Foundation. The money was raised by 140 local golfers and businesses who took part in the inaugural ‘PK Motors Golf Day’ at Matfen Hall. And as a gesture of goodwill Newcastle and England Football legend Alan Shearer made a special appearance to handover the sizeable cheque to members of the charity on behalf PK Motors. The Lily Foundation is a charity set up to support children and families affected by Mitochondrial. The foundation are making huge strives with diagnosing families and working with top scientists to find a cure. The disease prevents the body’s cells from producing sufficient energy and can lead to seizures, breathing difficulties, muscle weakness, diabetes and fatigue. Auction prizes, including a week’s holiday for four within a golf complex at the Costa del Sol, a Euro ’96 England shirt signed by Alan Shearer, a cricket bat signed by the Durham County Cricket Club team, a rugby ball signed by the Newcastle Falcons and a Sunderland AFC shirt signed by Niall Quinn and Kevin Phillips. PK Motors Swoops to sponsor local talent. Following successful sponsorship’s of local cricket and football teams in the area, Swalwell based motor retailer PK Motors, is spreading its wings further into the community, this time teaming-up with ‘up and coming’ Falcons rugby star Andrew Foster. Born and bred in Blaydon 23 year-old Foster has successfully moved through the ranks of local rugby, eventually getting his chance to star in the first team of the Premier League Rugby Union giants. Paul Keighley, Owner of PK Motors, said, “When I heard that individual player sponsorship’s at the Falcons were up for grabs I moved quickly to secure my man. PK Motors is based in Swalwell and has quickly established itself as a successful and reputable Motor Retailer based in the North East and across the UK. Recently they opened a new indoor car showroom which displays up to 35 quality used and nearly new cars. All vehicles offer a minimum 12 month warranty endorsed by Halfords Auto Centre including 12 months MOT and free from advisories. PK Motors delighted to be ‘batting’ for Allendale CC. PK Motors is delighted to be official car sponsor of Allendale Cricket Club. We are a local business and pleased to announce our support for such a highly regarded and successful community cricket club. We are enjoying exciting times at PK Motors and since opening our doors nearly three years ago we have quickly established ourselves as a successful and reputable motor retailer based in the North East and across the UK. Due to overwhelming demand and popularity we have recently invested in a new indoor car showroom which now display up to 35 quality used and nearly new cars. All our vehicles now offer a minimum 12 month warranty endorsed by Auto Centre including 12 months MOT and free from advisories. We pride ourselves in providing the highest levels of customer service and value-for-money and have a huge passion and desire to find the best possible car for your personal needs and most importantly your budget. GOLFERS from across the North East braved the elements to tee off for charity at a special fundraising event – and smashed their £3,000 target. The disease prevents the body’s cells from producing sufficient energy and can lead to seizures, breathing difficulties, muscle weakness, diabetes and fatigue. Teams teed off at timed starts throughout the day with prizes for the longest drive, beat the pro and nearest the pin and play was followed by a barbecue along with entertainment from a close-up magician. Guests then bid for a variety of auction prizes, including a week’s holiday for four within a golf complex at the Costa del Sol, a Euro ’96 England shirt signed by Alan Shearer, a cricket bat signed by the Durham County Cricket Club team, a rugby ball signed by the Newcastle Falcons and a Sunderland AFC shirt signed by Niall Quinn and Kevin Phillips. Paul Keighley, director of Swalwell-based PK Motors, which organised the event, said: “It was a fantastic day from start to finish, despite the weather and I am very grateful to all those who took part. For further information about Matfen Hall Hotel call 01661 886500 email [email protected] or visit www.matfenhall.com. TRACKER has been the UK’s leading stolen vehicle recovery expert for 20 years, offering high tech car security solutions. They also offer fleet tracking for businesses too, ensuring your vehicles are kept secure, whatever use they have. If you fit a TRACKER device, you can be sure that it is not only insurance approved, but also that it has been made using their award-winning, unique technology. TRACKER also has nationwide support from all UK police forces, so you know that the authorities are at hand, should your vehicle ever be stolen. With TRACKER, you have the best possible chance of retrieving your stolen vehicle because you have the support network, but also the very latest in cutting edge tracking technology. Young cricket enthusiasts at Northumberland and Tyneside Cricket club, Swalwell have been bowled over by the generosity of local car dealer PK Motors after they were presented with new sweatshirts as part of a new sponsorship deal. The new partnership with PK Motors will help Swalwell ‘drive’ forward on all levels, as a leading local cricket club, and ensures valuable funding throughout the 2015 championship campaign. Paul, Managing Director, said “I live locally and recently set up PK Motors and wanted to associate my business with the people in the local community and grass roots sport at all levels. “Swalwell cricket club is a fantastic example of this and is steeped in tradition, has a fantastic reputation throughout the region and is a great example of a well run and successful club. Ross Whitfield, Under 11’s Head Coach, Swalwell CC, said, “This sponsorship deal ensures that all the Juniors, second team and first team players will also be kitted out in the new kit for the season ahead. Mark Jones, Player Manager of Newcastle Homeless and Recovery Football team, who play in the Newcastle Corinthians league….was so desperate to get some new kit and sponsor for his hard-up football team, he devised a plan to challenge a local businessman in Swalwell, Newcastle Upon Tyne… to a penalty shoot out challenge. If he scored five penalty spot kicks out of five past the owner of PK Motors, businessman and feline goalkeeper, Paul Keighley formerly nicknamed the cat…PK Motors would agree to pay for the new kit and automatically qualify to be club sponsors. What could be simpler. However in a twist in events, as fans and locals gathered to see the hyped up event…Mark missed the first penalty…. which shaved the bar and thus losing the shoot out challenge on the first strike of the ball ! A devastated Mark was inconsolable and held his head in his hands..but then couldn’t believe his luck when PK Motors as a gesture of goodwill, said they would pay for the shirts for his beloved team anyway ! Mark said, “I couldn’t believe it. I was so confident I would win the challenge, although I had had a few beers at the time of making the challenge, and had been practising all week. I now know how geordie legend Chris Waddle must have felt when he skied that one for England against Germany…perhaps I’ll end up getting Pizza Hut as my next sponsor.